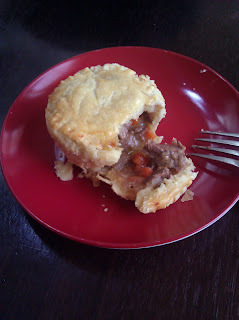 I only just realized that with my entry to Mini Meat Pies, I didn't include a pastry recipe. So here is one so you can make the entire dish from scratch. It's a standard pastry recipe that I found in a "Handheld Pies" book that was prominently displayed in the library... I'm sure they placed the book there, just for me! haha. Although they don't have the meat pie filling, there are lots of other uses for this pastry including homemade pop tarts ideas – what about Peanut Butter & Jelly, or Orange Marmalade-Marscapone, or Raspberry-Rhubarb? I must give those a try and will let you know how it goes. Similar to the pie crust recipe for both pecan pie and quiche and onion tart, if you have a food processor, it's pretty painless to prepare. If you are making the dough by hand, then it using your fingertips and a lot of patience, it still produces the same result. It uses a lot of butter, but that's what makes the crust really flaky. I managed 8 mini pies (tops and bottoms) with these measurements. Prepare the dough BEFORE the filling, giving it ample time to rest in the fridge. Although it is fiddly to work with, they taste great! Cut the butter into small cubes and freeze for 10 minutes. Measure flour, sugar and salt into food processor and pulse a few times to combine. Add the hardened butter until the mixture resembles oatmeal. Tablespoon by tablespoon, add the iced water until the dough looks like it is just about to clump into a ball. Make sure it's not too crumbly. Add another tablespoon or two of water, if necessary. Scoop out, divide into two even parts and form two flattened disc. Wrap in cling film and refrigerate for at least 2 hours or up to 3 days. Roll out to a 1/8" (3mm) thickness. Make sure to cut your circles much larger than the muffin tin, in order to leave an overhang so that you can tightly pinch together the edges of top and bottom. Continue to recipe. Here is a dough that is much easier to work with, though not as flaky as above.